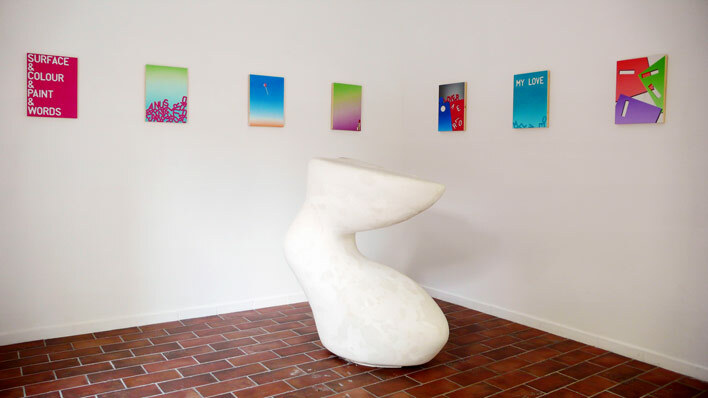 Galleria Lorcan O'Neill Roma opens its third Street View exhibition in the gallery's secondary space on the corner of Via Orti d'Alibert and Via della Lungara, with the project History by Eddie Peake. On display is a set of small, perfectly crafted oil paintings on board. These paintings are full of bright candy colours, with delicately graded horizon effects and unexpected details that play with what is real and what is not; what is in the world and what is fantasy. Their surfaces are glossy to the point of flawlessness, becoming themselves a subject of Peake's work. Accompanying his paintings is one of Peake's sculptures, entitled History Passes Through Me (Alberto Viani). Made of smooth plaster, its evocative curves and bends recall the human form in an abstracted, anthropomorphic way. With this sculpture, Peake makes explicit reference to a 1954 sculpture by Alberto Viani, as well as to past work of his own, and to the history of modernist sculpture. Fourteen of the artist's photographs are also exhibited, printed on A5 paper in high-octane colours, which are arranged in the spectrum of a rainbow. The photographs' candid physical imagery is sugarcoated by these bright hues - the ambiguous psychology behind them inhabiting a saccharine world of luminous, acidic colours that only truly exists within the artificial confines of Peake's painterly language. A fundamental component of Peake's practice is an investigation of language. This is combined with the autobiographical narrative woven into Peake's work in a set of works on paper included in the exhibition. Using mass-produced pictures from fashion magazine, Peake appropriates these images by labeling them with his own name, written in heavy black ink, or with original phrases. He uses space created by and for one mode of communication (advertising) to convey his own statements and messages. In playing with words, fonts, and recognizable characters - Casper the Ghost, for example (a reference to the artist's middle name, Caspar) - Peake twists the images' original intentions to represent his own narrative. Eddie Peake was born in London in 1981. He lives and works in London and Rome. He has had solo shows at The Hex in London (2007), Parade in London (2008); and has participated in group shows at Rod Barton Gallery in London (2010), Bezalel Academy of Arts and Design in Jerusalem (2010), Reference Gallery in Richmond, Virginia (2010), and Tate Modern in London (2010). Peake was awarded the 2005-2006 Audrey Wykeham Prize at the Slade School of Fine Art, and won an Abbey Scholarship at the British School at Rome for 2008-2009.